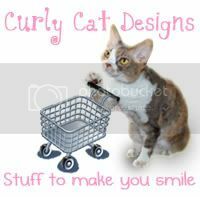 Daisy the Curly Cat: A Black Friday Special! Sorry I am not modeling today. This is because today is Black Friday. And since it is the biggest shopping day of the year, I have a giveaway again this year for you! I am giving away one of my new 2011 calendars! All you have to do is leave a comment on this post, and we will have a random drawing to pick the winner. Since we will pick the winner on Sunday, you should comment before 5:00 am on Sunday, eastern time. 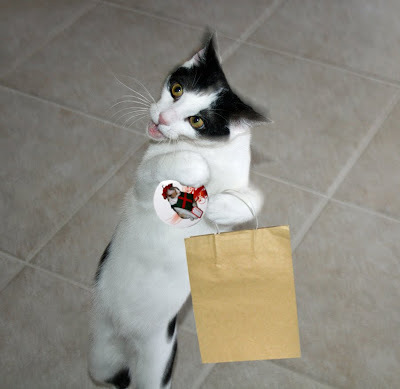 I hope after today, your shopping bags will be filled with holiday goodies! Harley has already started his shopping! If you already have a 2011 calendar and you win my drawing, you can pick any of the single buttons, magnets, small mugs or holiday ornaments instead! Click here to browse in my CafePress shop! have a good day shopping. Oh I hope I win! I hope you and Harley find lots of bargains today! 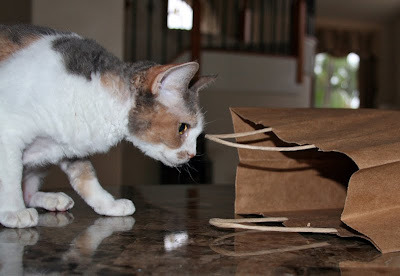 Harley always has a jump on the holidays :)Daisy I am sure your shopping bag will be filled with goodies very soon. MOL, Daisy, I think we have enough calendars here right now! But I would still like to be entered in the contest because I think it would be nice to be able to pick another item from your store! P.S. My human never goes to stores on Black Friday - she thinks the shoppers all have the same facial expression that Harley does today! She cannot compete with that. It sure would be fun to win! We're going to check out your shop, too. That is very generous of you, Daisy! Thank you Daisy and Harley for being so fun! I would love a new calendar. I just told somebuddy yesterday that I was getting a new picture to see next week because it's December. So excited. Even if I don't win, I will buy a new calendar because I love you both! Oh, I'd love to win your Calendar, Daisy. Me and my mum are big fans of you and Harley. Wow! Is this giveaway open to non US kitties? Daisy and Harley's calendar....would be the bestest present ever!!! We didn't know what Black Friday was and just googled it. If we had come here first we wouldn't have needed too because you just told us! Mum does most of her shopping online now because she doesn't like all the crowds. If your giveaway is open to everyone can you enter us please. Woo hoo, a Daisy and Harley calendar! Daisy we really want to be in the drawing. We had last years calendar and would love to have this years too. We love looking at pictures of you and Harley. Hope you have a very fun day. Daisy, now the song "Calendar Girl" by Neil Sedaka is stuck in our heads. We would love to have you hanging around our house, your caledar that is! ps-Harley's expression is just a wee bit scary today. Great job getting started with your shopping, Harley! I hope I win!!! I love looking at both your adorable faces!!! How exciting and what a fun prize! You and Harley are always so generous. Have a wonderful weekend! We love giveaways. We are going to visit your CafePress Shop. It is raining here so we thinks the Mom is going to cuddle with us instead of going shopping. Hope you find lots of goodies for your bag. Giveaways are so fun :) and I bet your calendars are awesome. Daisy, you deserve the day off from modeling :). We'd love to be included in the draw for your calendar- what a generous offer. Our mom says she's going out to do some shopping today...we hope she makes it back! Absolutely we'll enter the draw, if Canadian kitties can do so. Hi, Daisy & Harley - we don't mind you not modeling... we like the candid shots of you as well. Our mom won't do Black Friday...she says she'd rather pay full price than deal with all the crazies out there!! Please enter us in your giveaway, Daisy. We would love to win your calendar! I always love a giveaway! Hope you had a nice Thanksgiving. I sure would love to win! I'm going to check out your shop, too. Oh, I would love a calendar! Happy Friday! Happy Black Friday, Daisy and Harley! Hope your mommeee gets you lots of nice presents today. I have two cats but they don;t know how to type yet! Me Daisy and Harley...me me me me me!!! Miss Daisy, I bought your calendar last year and I LOVELOVELOVED it! I got my daily dose of curly furs and Harley Quinn and a whole new picture every month. It was great! Good ol Harley... He seems ready for anything. We would like to win your Calendar. Please put us in the drawing. Harley cracks us up. Oh this is very exciting! I would love a Daisy calendar! oh a daisy calendar giveaway! what is there not to luv! It would be very exciting to win one of your calendars! Thanks for the opportunity Daisy! 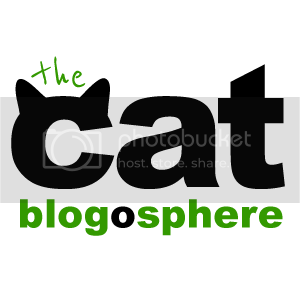 You both make my day and I love getting your blog, it makes me happy. Daisy, I'm sure your bag will be filled very soon! I hope you and Harley have a wonderful holiday season, with lots of special treats and toys, and fun with your mommeh! That is an awesome give away, Daisy! You are as generous as you are creative! Tuk Tuk and I am so happy to be getting your posts again! For a while we weren't getting them and we missed you so much! We are spending a nice quiet Black Friday at home. We hope Harley finds lots of bargains this year! He can have all the crowds! Ha! Our Mom is staying home today. She is not much of a shopper. We hope your shopping bag gets full of great surprises for you and Harley! Daisy and Harley are beautiful, healthy looking kits. That's a sooper deal - count us in! I'm definitely in for winning one of your great calendars! That is very nice of you Daisy. I would love to have one of your calendars. Can I be in da giveaway too? MMM. Turkey and shopping. (I hadn't been on here in a couple days) Don't overgorge on tryptophan! Oh Daisy, we would love, love, love to win yoor calendar! We hafta tell ya, dad went to da sales dis morning! Mom stayed in bed until da usual time and den went to da shelter. No shopping fur her as she doesn't like it. Oooooh, I hope I win a Daisy and Harley calendar!!! Please pick me! Please pick me! Happy Thanksgiving Dasiy and Harley! Love from, Madison and Keegan! I would love your 2011 calendar - thanks for the chance! Now I'm off to check out your cafe shop. 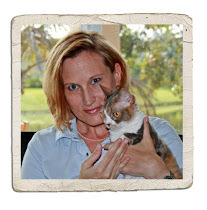 Daisy, we hope you and Harlet and your Beans had a nice Thanksgiving Day together! We will go check out your store...NOW! Pooh, can I please enter? Have fun shopping! Oops I meant to say ooh not pooh, sorry! That's so sweet of you to give away one of your calendars, Daisy and Harley. I would love to be entered in your drawing. Happy weekend - so nice to have an extra long one with the humans home. How exciting! Your calendar looks excellent...I hopes I win! We bet your calendar is beautiful Daisy! Actually, we'd like to win that bag too......! Whee! I want to win! :) Would love to have that calendar at my work cube next year! Hope you cats have a great holiday weekend! Daisy, I am thankful for you and Harley every day. I'm thankful you share your lives with us and spread happiness around the world! So excited for a chance to win. :) Thanks Daisy! Wow, Harley, awesome job on starting your shopping already! Gosh Daisy and Harley, we would love, love, love to have your calendar! You are so sweet to have this giveaway ... and we may sound selfish but we hope we win, hee hee! 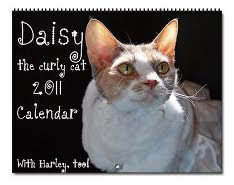 Oh, I would love a Daisy and Harly calendar! If I win I'll make Mom hang it low on the wall so I can see it every day! OMC, you have your own calendar???? Then again, why should I be surprised when you are such a super model. Mum didn't go shopping today, just to the library to drop off her books. I would love to have a chance to win a Daisy calendar! Daisy, thank you for the very nice words you left on my Blog. I hope you and your loved ones had a very special Thanksgiving. 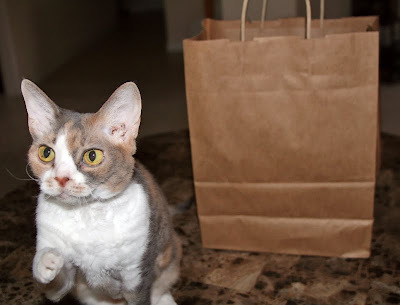 Being a kitty and all, wouldn't you rather if the shopping bags stayed EMPTY? 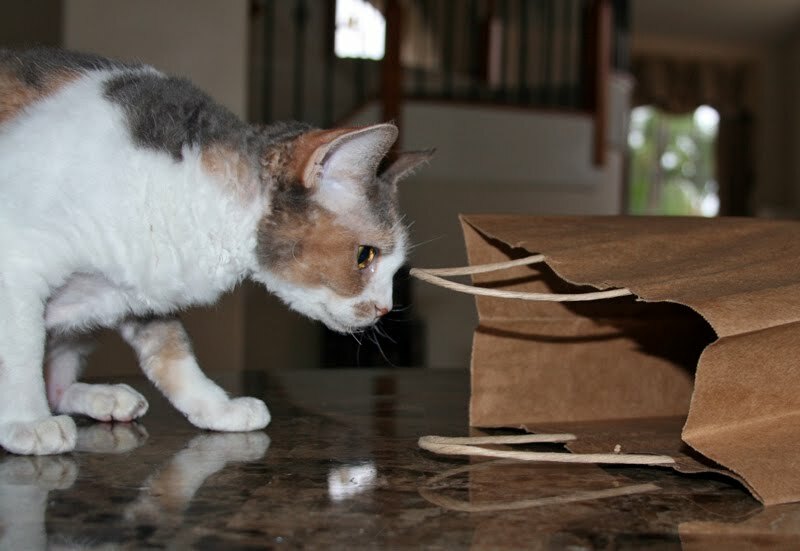 Seems like they are much better cat toys that way. Please visit me again. Daisy, you are so cute. And Harley you are the cutest shopper! we SO want to win a calendar of our hero daisy! please count us in!!!! Oh, exciting! You always have the cutest products, Daisy. Oh! We would luf to win your calendar! PIK ME PIK ME PIK ME!!!!!!! Mom and Dad tried to stay out of the stores today! Happy Thanksgiving Weekend. We enjoy your calendar every single day. The photographs are perfect and since it is hanging in the kitchen next to the washer and dryer I smile every time I look that way. I saw how much you ate for Thanksgiving and have but one thing to say. "Darling there is always room for dessert!" Hope you were able to fill those bags up with all kinds of goodies. Way to contribute to the economic recovery, Harley! Yay! Your calendar is purrrfect! I want one for my office!!! Wow!!! A Daisy Calender!! That would be great!! Please enter us! Am I allowed to enter even though I am in Australia? Yay, thanks for having this giveaway! We would love to be entered into the draw! We would love to win your calendar, but I see so would 98 others so far so we don't have much chance. Oh well, can't win if we don't enter. I'm glad i saw this today! maybe a last minute comment will get me the win. I really <3 you and Harley. ooops too late. Happy bonkful Sunday to you and Harley, Missie Daisy. Hope you had a nice thanksgiving time with your folks! I miss the time for the drawing the mom and dad here were on the road traveling to get back home. The one that wins this sure will be a lucky one with having you on each month to see.